The first Full Moon of northern spring rises behind four distant towers in this telescopic view. 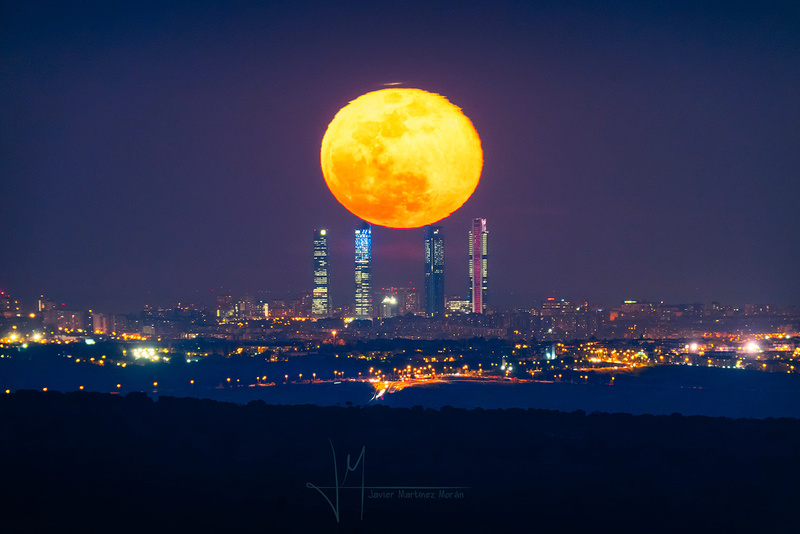 In an image captured from some 40 kilometers west of the city of Madrid, this moonrise also represents a near coincidence of the full lunar phase with lunar perigee and the March equinox. Close to the horizon, the Full Moon’s strangely rippled and distorted shape has more to do with the long sight-line through a layered atmosphere, though. Tantalizing visible effects of the substantial atmospheric refraction include the appearance of a thin floating sliver just above the lunar disk. The remarkable optical mirage is related to the more commonly witnessed green flash of the setting Sun. Posted on Saturday, 23 March 2019 by VGC	This entry was posted in ifttt-photograph and tagged IFTTT, NASA. Bookmark the permalink.